In the previous post we looked at the other side of the street. We have looked at a couple of the buildings on this side of the street in earlier posts. To the right of the lamppost in this 1930s Vancouver Public Library image is the Emil Guenther designed Eagle Temple built in 1914, with H S Griffith’s 1912 West Pender Building beyond it – still standing today. The 1912 insurance map shows all the lots on the west side of Homer developed with houses like the ones on the left of the picture, all also shown on the earlier 1901 map, (when the east side was also all houses). Those are all too old for us to easily trace their building permits. A few were hanging on in the 1930s, although the Eagle Temple had replaced a large house on a double lot. A new building had replaced another of the houses, apparently in 1930 when Vancouver Stationers Ltd first appear in the Street Directory. O Weber was President and Treasurer, and W J Hagel the vice-president. It’s not entirely clear what their slogan ‘the quality of our printing is consistent with the prices we charge’ meant. Were they inexpensive, but ‘hey, you get what you pay for’? Or expensive, but worth every cent? 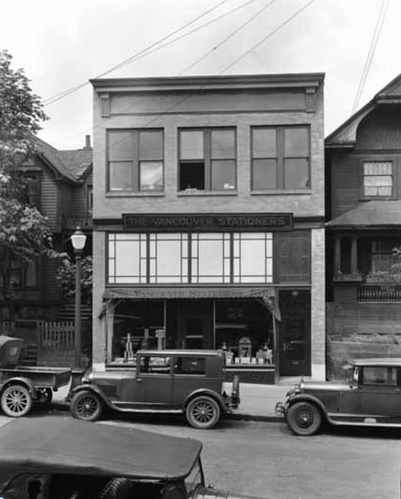 The company had previously been in business on Granville Street, and the Public Library also has this 1930 Stuart Thompson image that was probably taken on completion of the building. It shows that there was still a house tucked away in the gap between the Eagles Lodge and the new building. In 2004 Belkin House, a new facility for the Salvation Army was completed, with over 100 rooms and capacity to have over 200 people sleep in the building.